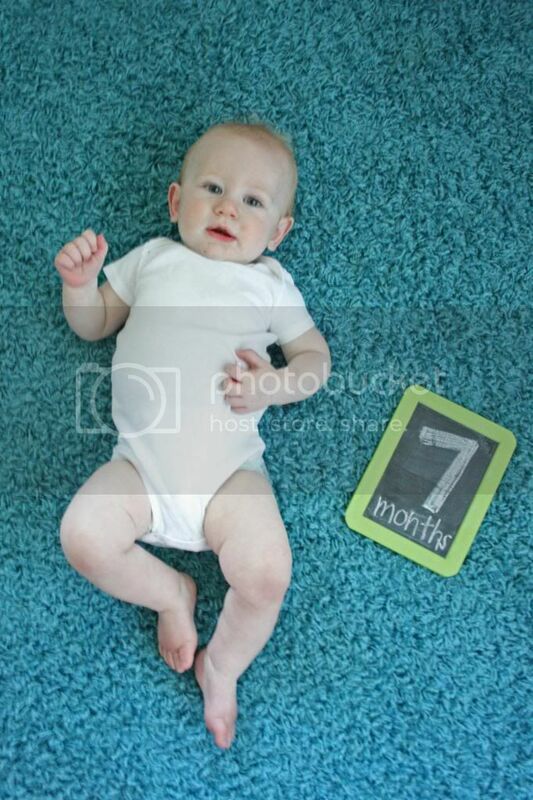 Jordy Liz Blogs: Dear Liam, You are seven months old. Dear Liam, You are seven months old. As soon as you hit six months, you starting hitting milestone after milestone. After rocking on your hands and knees for just a few days, you figured out how to actually move and crawl. As soon as you could crawl, you would crawl to the nearest piece of furniture and pull up to standing. And as soon as you pulled up to standing, you made that your mission every time we put you down. You now stand in your crib as soon as you wake up, just waiting for us to come find you. You also found the stairs at your Pop and Juney's house and immediately starting making your way up. You can go from crawling to sitting to crawling to pulling up and we really can't keep you from moving. Sit still? No way. Lay you down on the floor for a second? You'll beat us to the other room. I think I've said this since day one, but you literally never stop moving. You are also starting to hold on with just one hand once you've pulled up to stand, which makes me think you are close to practicing your balance. And we all know what comes after that, so slow down, mister. You have also starting clearly saying "Mama" along with your other random babbles. Though I thought "Mama" was a fluke at first, I soon realized that you only say it when you see me walk in the room and you want to be picked up. You also say it when someone else is holding you and you see me walk up. So after a couple weeks of this, I'm thinking you might realize I am definitely Mama. In fact, a friend in the restaurant the other day said, "Did he really just say Mama to you?" You are loving food and are officially a bottomless pit. You take three meals a day of fruits and veggies and love putting anything we give you straight into your mouth. It's been fun adding the food routine to your day, but I already see our future with a teenage boy who may just eat us out of house and home. You're growing up on us so fast, that while you developing so quickly is fun and convenient, there is also a part of me that just hopes you'll slow down just a bit so I can soak in this time with you as a baby. You're so big, little boy.